For many years’ hunting I was completely uninterested in antlers: the bones and antlers were only so much weight to carry out of the bush, so I carried out only the meat; some for the dogs, some for the family. After many years of experimenting with venison I reached the conclusion, ‘there is no such thing as a tough rissole’ so it all went through the mincer; adding some pork fat at this stage made for an acceptable Spag Bol or Cottage Pie – but venison will never be lamb (which, being sheep farmers we had plenty of), just more fun to hunt! Occasionally someone else would want a nice pair of antlers so I let them have them. 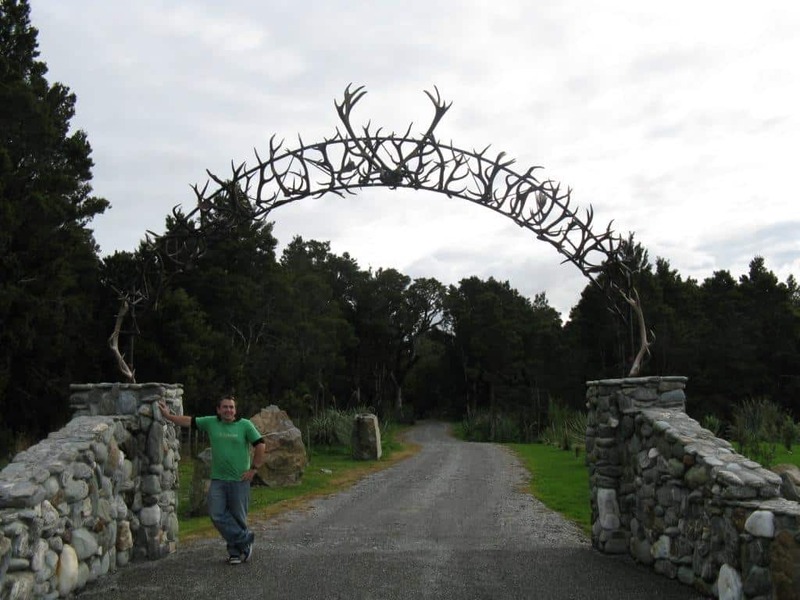 Travelling around NZ with my son in 2008 we spotted this excellent Antler Arch near Hokitika; my wife would like one too! It is one thing acquiring enough antlers for such a project by helicopter culling in NZ and quite another putting them together from sambar stalking in Vic – but I will work on it! My wife also admires those antler chandeliers, hat racks, tool handles etc, and has many crafty projects for them cut into itsy pieces, so I drag one or two back now and again for her amusement. At 66 though, I am more interested in just getting myself to and from some mountain stronghold without being encumbered by unnecessary weight. The Jack Russells appreciate having their efforts rewarded by my knocking over a deer now and again, but they are doing well to eat half a kilo – and live quite well on ‘Smackos’, which are lighter! If you have wondered why you do not find more antlers/bones, it is because they are recycled for their calcium/phosphorus etc by rats, dingoes etc – even by the deer themselves! Australian soils (particularly forest soils) are often drastically mineral poor – I suspect due to many centuries of injudicious indigenous burning, followed by heavy rain leaching the soils to a miserable poverty. This is also why they are (now) dominated by wattles and gums (plants which can tolerate low phosphorus/potassium levels)) which was not the case before their arrival many centuries ago when eg Bunya Bunya Pine was then a much more dominant tree all along the Eastern seaboard accompanied by all those trees one only finds as relict in rainforest gullies where there remains a better concentration of essential nutrients. It is rare indeed to find a salt/clay lick. When you do find one (in thirty years I have only found a handful – and I’m not going to tell you where), they are an unbelievable magnet for deer and a myriad other creatures. This may be one advantage to following game paths. Waiting patiently by such a lick, you will get to view an interesting succession of visitors.